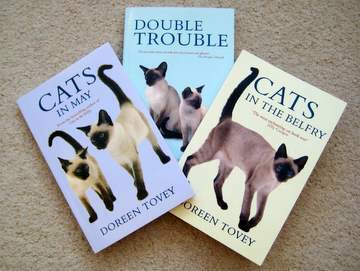 I first discovered Doreen Tovey's books about Siamese cats and other animals a long, long time ago, so I was delighted to find recently that some of the books are now back in print. Spanning a period of around 50 years (her first book, Cats in the Belfry, was written in 1957) Doreen's autobiographical novels describe her life in the Somerset countryside with her Siamese cats and husband René (better known in her books as Charles). The cats are supported by a cast of many other wonderful characters, both animal and human. These include Blondin the nut-hoarding, brandy-drinking squirrel, Annabel the donkey, Tarzan the Tortoise and neighbors Ern, Fred Ferry, Miss Wellington, Sidney the accident-prone gardener and the wonderful, irrepressible Father Adams. But it's the cats who are the real stars. The Toveys bought their first Siamese cat, Sugieh, a Blue Point, because they were overrun by mice. Needless to say, being Siamese and contrary, Sugieh wasn't interested in the mice. What she did do was to race up the curtains and hurl herself at the birdcage. After Sugieh dies, devastatingly suddenly, Doreen and Charles keep two of her kittens, Solomon and Sheba, who are succeeded over the years by Seeley, Shebalu, Saska, Shantung and Saphra, all of whom in their own way are as utterly devilish and enchanting as only Siamese cats can be. Doreen has a wonderful, warm, and witty way with words that bring the personality of each cat to life and perfectly describe her love of them. "I had never, for a moment, taken [Solomon] for granted. high-boned features of the East from which he came. His face shone with dusky silk. communicative eyes I have ever encountered in a cat." Doreen Tovey lived in Rowberrow in Somerset. She was brought up in Bristol by her grandmother and aunt, after her mother died from 'flu just two weeks after Doreen was born. Her father, an engineer, was often away from home. Life in Bristol with Grandma and Aunt Louisa is described lovingly in Life with Grandma. Doreen's grandmother was an animal lover and the house was never without an odd assortment of cats, dogs, and even an owl, called Gladstone. After leaving school Doreen found a job with Imperial Tobacco, first as a typist, then secretary, and subsequently as a writer in the Public Relations department. Here she met her husband, but six months later war broke out and Charles joined the Royal Navy, returning only briefly to get married. After the war they returned to work in Bristol and settled in Rowberrow, finding the perfect house in which to live with their assorted animals and cats. Doreen adored her cats! She was President of the Siamese Cat Club and of the North Somerset branch of the RSPCA. 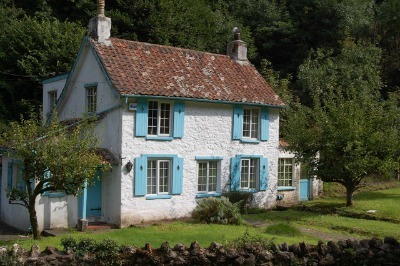 Doreen's house, White Cottage in Rowberrow Bottom, Somerset. The picture above was taken in 2008, the year of Doreen's death. I'm very sad to say that the house no longer exists - it was demolished in 2014 by the current owners of the land. Doreen Tovey died in January 2008, at the age of 89, so there will be no more of her gentle, funny, quirky books about Siamese cats. She was cremated and her ashes were scattered, with those of her husband, on the hillside in Rowberrow opposite the house where she lived, White Cottage. Rest in peace, Doreen, and may you forever be surrounded by Sugieh, Solomon, Sheba, Seeley, Saska, Shebalu, Shantung and Saphra - and Charles, of course! In 2010 I was contacted by a cousin of Doreen's, author Caz Greenham. Caz left a note about her family relationship to Doreen Tovey, and many visitors have left comments about how much they'd loved Doreen's books over the years. Caz is, like her cousin, also a writer, although there's not a cat in sight in her books - her hero is a quirky seagull! At the time that she wrote to us, Caz was still looking for a publisher but happily she found one. The Adventures of Eric Seagull 'Story-teller' - Book 1, The Mysterious Sea Creatures, and Book 2, A Fairy's Wish - children's magical adventures - have now been published and are available, as they say, from all good bookstores! A third book is a 'work in progress'.